Compared to the nation’s other very large cities that grew rapidly in the early Twentieth Century—New York, Chicago and Philadelphia—few large apartment buildings were built in Detroit. The availability of low cost land in Detroit permitted the city to sprawl outward, a process that was also encouraged by the absence of heavy rail transportation within the city. The city’s waterfront was then and continues to be extremely attractive so, as Detroit grew, a dozen or so large apartment buildings were constructed near the river along or close to East Jefferson just north of the MacArthur Bridge to Belle Isle. This area is now being promoted as Detroit's "Gold Coast." Alden Park Towers consists of four eight-story buildings that originally contained 352 apartments. These structures are excellent examples of the Tudor Revival style using much gray stone trim and red brick facades. Personally, I think that the crenellated limestone at the roof line is one of the most appealing features and distinguishes these buildings from all other apartment houses in Detroit. The exterior is highly ornamented as you can see by looking at the buildings or the picture above. The projecting bay windows are another distinguishing feature found in each building. They extend from the ground to the roof line where they are capped with an octagonal roof. C. C. Williams, a real estate developer perhaps from Phildadelphia, decided to profit from urban growth in the post World War I era. He had rather similar buildings erected in three cities. His architect, Edwin Rorke, designed the first co-operative apartments built in Philadelphia at the corner of School House Lane and Wissahickon Avenue. These are known Alden Park Manor and are also listed on the National Register of Historic Places. He also designed the Longwood Towers apartments in Brookline, Massacusetts. This building has been converted to condominiums and is within an area listed on the National Historic Register. In 2005, a new owner purchased Detroit's Alden Park Towers. In 2008, the new owner announced that 54 million either had been or would be spent to modernize the property. I believe the renovation created a total of 389 appartments in the four buildings. These plans were not accomplished and, by 2012, Alden Park Towers was in foreclosure. A Colorado firm, Triton Properties, purchased the structure for two million dollars. The following year, they began investing five million dollars to renovate and modernize the apartments. This may be a favoarble and positive sign. Because of the vast improvements along the riverfront from the Ren Center to Belle Isle, people living in this Gold Coast area can readily walk or bicycle to work in downtown Detroit. It is foreseeable that some of the neighboring apartment buildings will be similarly renovated as the city's employment structure and demographic composition change. 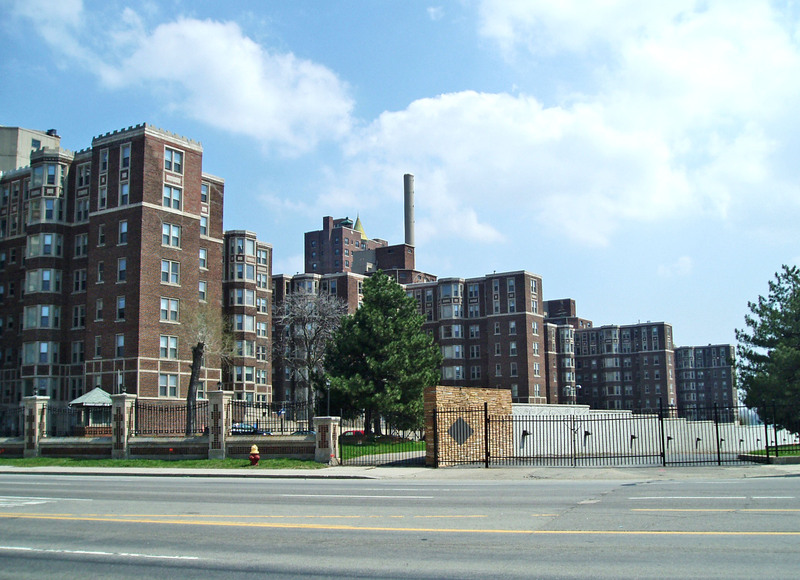 Edsel and Eleanor Ford lived in a massive and attractive home with property adjoining the Alden Park Towers. Needless to say, they were upset at having this huge apartment complex in their back yard with its hundreds of residents. Rather than remaining at their riverfront location in Detroit, they asked Albert Kahn to design the magnificent Ford estate located at 1100 Lake Shore Road in Grosse Pointe Shores, a home that is as famous for the landscape achievements of Jens Jensen as it is for the Kahn structure. The Edsel and Eleanor Ford home on East Jefferson was razed. National Register of Historic Sites: Listed November 9, 1985. This complex is a component of the East Jefferson Thematic Resouce listed on the National Register.